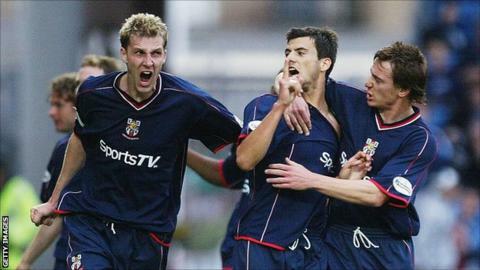 Bury coach Ben Futcher has said the death of former team-mate Richard Butcher put football into perspective. The pair played together at Lincoln City for three years and remained close friends until Butcher passed away in January 2011, at the age of 29. Midfielder Butcher, who was playing for Macclesfield at the time, died from a rare heart condition. And it was Futcher who was sent to check on his friend after he failed to report to training. "I was good friends with him from our time at Lincoln and we lived in a similar housing area," Futcher, 31, told BBC Radio Manchester. "Out of the blue one morning he never turned up for training. I got a phone call from the manager at Macclesfield [Gary Simpson] and he said 'Where's Butch today? He's not been in and he's not rung'. "So I went to see what was happening and the rest is history. "I was worried, but I don't think anything could have prepared me for what we were to find when we went in. "He'd had a heart condition through the night while he was in the house on his own. He'd gone to bed and he never woke up. "It was difficult to take and it was difficult to accept, and it still is. You don't forget it or get over it, you just learn to live with it. "When something like that happens, it puts a lot of things in perspective. You spend a lot of time worrying in football and you have a lot more lows than you do highs. "But when something like that happens, it doesn't half put things into perspective regarding your family and what football actually means." The loss of Butcher was the second tragedy to hit the Silkmen in that year, following the passing of manager Keith Alexander the previous March. And while almost two years have passed since Butcher's death, Futcher says there are always constant reminders of their friendship. He added: "You move on a little bit. You don't forget but you have to get on with things. I still think about him a lot because I drive past his old house every day. "It's difficult to talk about. I don't talk about it a lot because I don't like digging it all up. It's very raw still. You don't expect that to happen so close to home. "He was a very close friend, a great lad, and he's sorely missed. It was a difficult time but I like to think I've come through stronger from it." Hear Ian Cheeseman's extended interview with Ben Futcher in BBC Radio Manchester's "In The Spotlight" programme from 18:00 BST on Thursday, 27 September and online for the subsequent seven days.